Today we’d like to introduce you to Pamela Staker. My story has been a pretty consistent if not totally straight line from childhood to now. I am an abstract painter. My mom is an artist and she raised me on it. I also excelled at math and science. I went to the University of Illinois at Urbana/Champaign as a math major and switched to fine art my sophomore year. It’s not as big of a leap as it seems – everything is problem-solving. After I graduated with a fine art degree in painting, I moved to Chicago and worked several jobs in my field with both a commercial gallery and a not-for-profit artist run gallery and finally with an art advisory firm before going out on my own. I needed to learn the business side of the art world in order to have a fighting chance. Please tell us about PS Art Projects. I am a Chicago-based contemporary artist with a concentration in large, colorful, abstract painting and mixed media works on paper. My studio is located in East Pilsen very close to Chinatown and the South Loop and I am open by appointment. I collaborate with a wonderful group of art advisors, dealers, interior designers, and architects, and am often commissioned to do site-specific works for both private and corporate collectors. Enhancing space through art is generally a group effort and I love the talented people that I work with. I have many examples of these collaborative efforts in the images below. In the near future, I am looking forward to participating in the River North Design District’s Gallery Walk. It is a highly curated effort by Daniel Kinkade Fine Art. I was paired with the interior design firm Blutter Shiff to created Haiku themed vignettes which dovetail perfectly with my body of work. 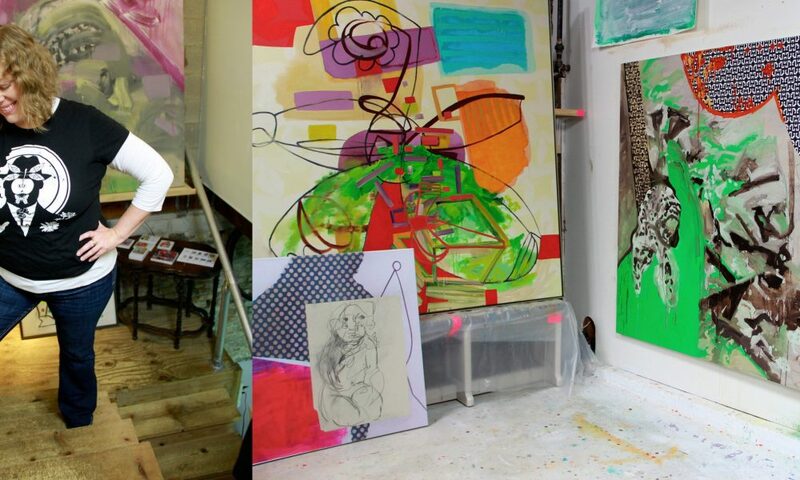 I am creating the works specifically for this space and will be exhibited at O’Brien Harris, 501 N. Wells. The opening reception is September 8th from 5-9 pm and artworks will remain on display through October 13th, 2017. I am also very excited to be starting a new project with my friend and fellow artist Kate Hendrickson. We are going to be making works as a team based on her Underwater series and my Haiku series. We are very excited to see where this collaboration will take us. It’s not so much a memory as a feeling. I always felt good around water or out in nature. I have a specific memory of being around 12 years old, at the pool, smelling the chlorine, and hearing the sounds of everyone playing while I am on my towel with my eyes closed and the sun beating down on me. I had such a feeling of peace and all is well in that moment. I felt warm and safe and free.